Sarah Meyer said her dog was shot by police after it was playing with a neighbor's 4-year-old girl and dog. She said the officer tried to throw a honey bun at the dog and shot it when it did not come. HIGGINSON, Ark. 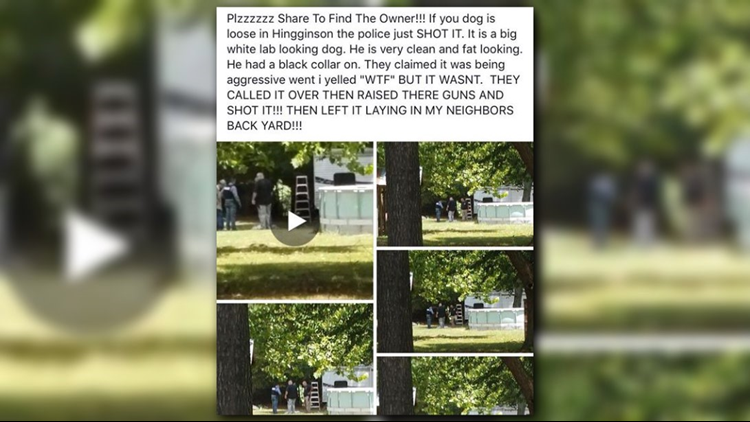 (KTHV) - A Higginson couple is distraught after they said police shot their dog Monday, but police say the dog was being aggressive. Sarah Meyer told us she received a call telling her to go pick up her dog's body out of a neighbor's backyard. McCoy, an AKC-registered Lab, escaped from his backyard by digging a hole under the fence. Meyer said she was shocked by the call. Meyer told us that it was "sickening and disheartening" that "we were not called/notified until after he was killed." Meyer also said the dog was shot right between the eyes. "We received a phone call to come pick our dead dog out of the backyard," Meyer said. "[Police] 'threw a honey bun at him, and he still wouldn’t come to them.' So I guess their only resort was to kill him. He was a beautiful, loving baby to us." Chief Eric Patterson said they were called to the scene after a woman was allegedly attacked by McCoy. The woman also said McCoy had attacked their dog and injured it. Patterson said officers worked anywhere between 20 to 40 minutes trying to calm the dog, but said the dog remained aggressive. He said the bark and the growl of the dog was "not normal." He said one officer crouched down to try and get McCoy to calm down, but the dog allegedly lunged forward and his "front paws came up," which is when the officer shot the dog. "Labs are normally really nice dogs," Patterson said. "We're just scared something might have happened to him prior to him coming over here. Might have been kicked, chased, bit by another animal." "I've never seen him aggressive," Meyer said. "He's not emotional, I mean, he's a Lab. Labs are the fun, good dogs." Another neighbor told us they told police that they had a kennel, but police called the dog over and shot McCoy. "Plzzzzzz Share To Find The Owner!!! If your dog is loose in Higginson the police just SHOT IT. It is a big white lab looking dog. He is very clean and fat looking. He had a black collar on." A screenshot of the Facebook post that has since been deleted. The post went on to detail how the Lab showed up and started playing at the poster's sister's house. She claimed that when police arrived, the dog started walking toward them with its head down and tail wagging. That's when she claimed that the dog was shot by police. She alleges that they then drove away, leaving the dog in the yard.